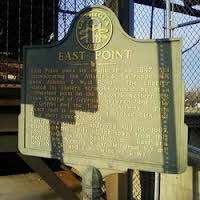 East Point was founded in 1851 with humble beginnings. Still considered a small city, located southeast of the major cities and neighborhoods of Atlanta, East Point has enjoyed resurgence in recent history. Home to the Camp Creek Marketplace and several other new businesses, East Point is also known for being the home to the Federal Bureau of Prisons Southeast Region Office and the National Archives regional repository for data collected by the U.S. Census. Additionally, the Fulton County School System has their headquarters in East Point. Tree removal in East Point requires a permit issued by the East Point Zoning Ordinance This applies to all trees greater than a 4 inch diameter-at-breast-height (DBH). In the ordinance, all single-family homes removing less than five specimen trees must submit a report through the tree removal company. If removing 6 or more specimen trees, an arborist certified by the International Society of Arboriculture must submit a tree replacement plan report. If more than six specimen trees are to be removed within a 24-hour period, proper documentation is required to show the trees are diseased or pose a danger to the health and safety of the owner and/or public safety. # Brian and his crew came highly recommended by a friend of the family. I had them come out to give me an estimate. The prices seemed fair and once the work was completed, I was impressed with the results. Thanks again Brian! Job Well Done!